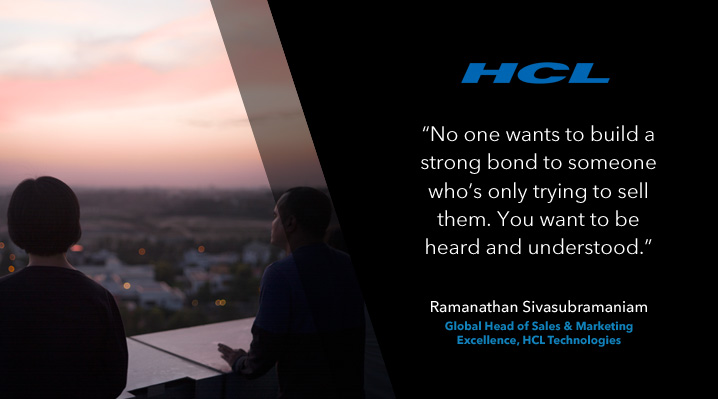 Discover how HCL Technologies uses LinkedIn Sales Navigator to foster enduring, authentic relationships. Every business needs a strong brand to stand on—you need to be known for something, and you need to deliver on those expectations. It can’t just be a slogan, it has to be something you act on and really put into practice. At HCL Technologies, our brand is built on our philosophy of championing the “Relationship Beyond the Contract.” That means our connections go beyond the terms of any agreement—the real value is found in the trust, transparency, and respect fostered between customer and provider. It’s an organic, authentic relationship where we come together to share ideas and create value. While that sounds wonderful, it’s no easy task. How can a large enterprise—with roughly 100,000 employees across dozens of countries—manage to achieve a sense of personal connection with each customer? We take a multi-pronged approach, but the first step might be the most important: getting to know the customer before the first engagement. That’s where social selling and LinkedIn Sales Navigator have made a real difference—it’s helped us deepen our relationships, and in doing so, deliver on our brand promise. Here’s how it’s worked for our team. We pride ourselves on enjoying genuine relationships with our customers. 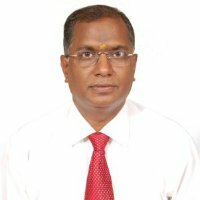 In late 2015, extreme flooding hit the region of Chennai, where we had about 30,000 employees operating. It briefly disrupted some of our services, but we didn’t get a single complaint—instead, our CEO customers were calling us and asking about the welfare and safety of the employees they worked with. Those are the relationships we foster here. But when you first meet a customer, it can be difficult earn their trust and develop that care immediately. Using TeamLink, our sales professionals are able to reveal existing connections with prospects. Once you’re linked by a personal connection, there’s instantly a greater sense of trust. That’s often the beginning of a strong relationship. No one wants to build a strong bond to someone who’s only trying to sell them. You want to be heard and understood. That’s why we put an emphasis on listening to their challenges first. One way we accomplish this is by saving leads and accounts in Sales Navigator. This allows us to follow important prospects, receive relevant alerts, and gain insights into their priorities and work environment. Then when we do engage, we can instantly start discussing their relevant needs. Our team will often share a piece of content, too, before an initial meeting. Just knowing we’ve read the same article creates a sense of familiarity that helps us lower our barriers. Our marketing team is also active on LinkedIn—they use Sales Navigator to research accounts we’re targeting and create content that’s most relevant and helpful for them. That gives our sales team a really effective tool to build a meaningful rapport. These practices don’t just happen automatically. We provided very detailed on-boarding training for getting the most out of LinkedIn. Otherwise, it’s like buying a grand piano but not investing in any lessons—just because you have the tool doesn’t mean you’ll use it right. We also track and encourage our teams by using LinkedIn’s Social Selling Index (SSI) as one of our main KPIs. It’s useful for benchmarking ourselves against our peers and seeing where we need to step up our training. One of the key programs my team runs is publishing a monthly newsletter focused around Sales Navigator. It has an internal leaderboard, so everyone can see where they stand, and includes success stories. That allows us to inspire each other and learn from our collective experiences—building relationships internally as well as externally. At HCL Technologies, social selling is a fundamental piece of our promise to uphold the “relationship beyond the contract.” Tools like Sales Navigator help us reach more people in way that reinforces our brand and signals the beginning of a powerful relationship.